Heed the siren's call and let the music carry you away! Provide advance information about upcoming musical events to angels, benefactors, and patrons, try the Violin Invitation. 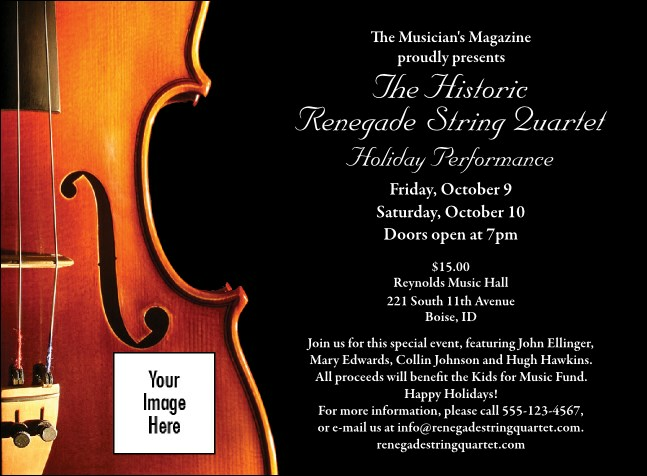 For concerts, symphonies, or classical music, this high-resolution image of a beautifully polished violin against a black background draws the crowds. Fill in your concert information on the template below. Welcome friends to any event with the right invitation from TicketRiver.com.au.